At 18.430 minute wave c would reach 1.618 the length of minute wave a. This is possible but unlikely. Minor wave 2 is too brief and shallow to have the “right look”. Sorry Victor, its a typo. I should have said 18.430 is 2.618 the length of minute wave a.
I agree, the Fibonacci retracements are wrong. There seems to be a problem with Motive Wave, its doing these calculations wrong. Dammit. That means I have to do it manually. What’s the point in having a Fib retracement tool if it doesn’t work? Ugh. So your statement here that “At 18.430 minute wave c would reach 1.618 the length of minute wave a.” which I commented on in an earlier post is merely a typo error. The ratio should be 2.618 instead. However, I still have problems with your other numbers. My calculation could not match up to those Fibonacci percentages in your chart for wave c targets: 61.8% (18.812), 38.2% (17.283), 23.6% (16.400). I refer to your Main Wave Count where you state: “At 18.430 minute wave c would reach 1.618 the length of minute wave a”. My calculation differs substantially from yours. My 1.618x length of wave a for wave c is 17.030. 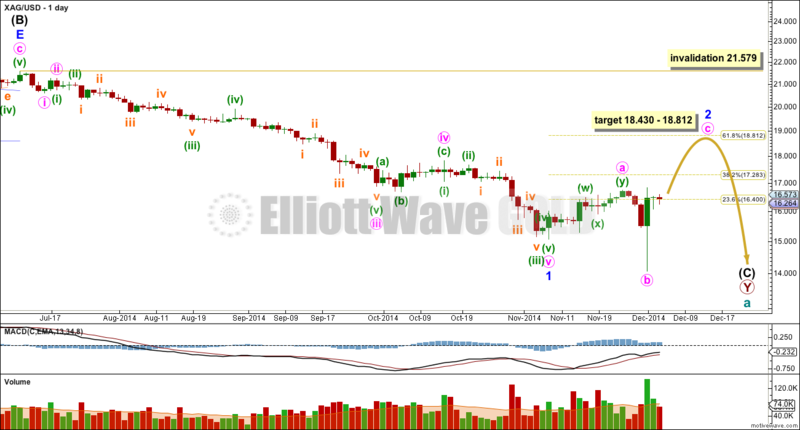 At the 18.430 target, wave c would have to be equal to 2.459x length of wave a. * wave c = 14.338 -> ?? Minute C in Minor 2 just (barely) passed the 38% FIB tgt. Will you keep us posted as to when you think Minor 2 is over? [Of course you will] I’m referring to your chart. The analysis description mentions minute iii, but I see ABC charted. Was feeling really anxious about waiting on he overall downward structure to resume, with minor 2 completed — Same for GOLD– and then I looked over some of the other comments. It’s really helpful, glad you have them. Your analysis has been correct so many times regarding overall direction. Thank you for that and for starting EWG.. I may throw up a Silver chart today for you. 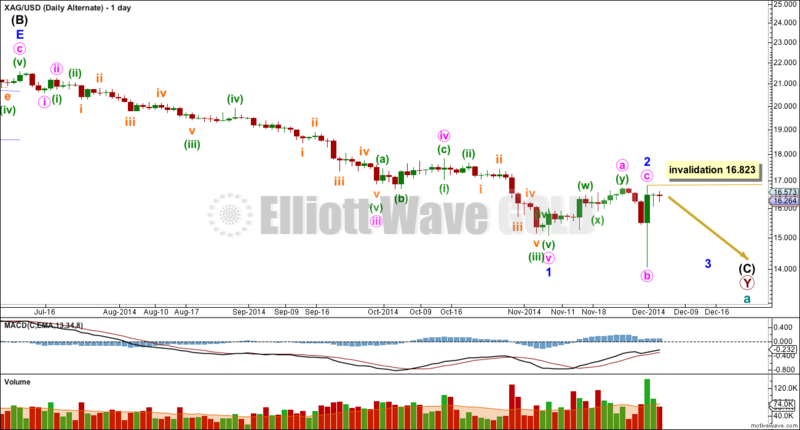 I think both Silver and Gold are today within minuette wave (iv). For both markets I see more upwards movement to complete the structure of a second wave correction (minor degree for Silver, intermediate for Gold). For both markets when that is done the downwards trend should resume in earnest, it will be VERY strong. But we’re not there yet.